Mountbatten Colony is run by Beaver Leaders Claire Bellamy (Hummingbird), Chloe Tebby (Hedgehog), and Melizza Hambidge (Otter) and Helen along with our Young Leaders. We meet on Wednesday nights at the Scout Hut from 5.45pm until 7.00pm. Our meetings involve a wide variety of topical events, challenges and activities with the Beavers having a big say in what they’d like to do. We can be making volcanoes, playing spotlight in the dark, heading out on Isotope collecting missions, making smoothies, and being Superheros. We also enjoy our themed sleepovers such as at Night at the Museum or Spy themes. During summer months beavers really enjoy hikes, kayaking, activity days at Youlbury and our annual camps Last year we had a Bear Grylls survival theme camp sleeping in Yurts., making water filters, firelighting and den building. 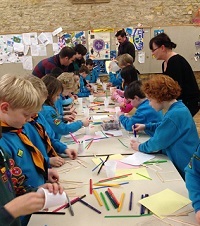 This year we look forward to OxonJam at Blenheim Palace, which will see around 5000 Beavers, Cubs and Scouts and Adult Volunteers from across the county. We also enter into the Witney Carnival every year. Beavers love making new friends, learning new skills, taking on new challenges and earning badges and awards along the way.